It’s safe to say -- boy, is it ever -- that the revival of Full House is not being greeted by the TV critic community with the same bow-down reverence reserved for Arrest Development’s sacred second coming. In each case, Netflix is the nurturing mothership, with the slightly retitled Fuller House arriving on Friday, Feb. 26th with all 13 Season One episodes. At the risk of being declared certifiable, Fuller House turns out to be better realized than Fox’s recently concluded six-episode serving of The X-Files, a thudding dud that burned the gullible faithful with yet another spaced out cliffhanger. At least Fuller House knows what exactly what it’s all about. Then and now, it’s a broad, intendedly feel-good family sitcom replete with group hugs, familial bonding, cute, scene-stealing little kids and telegraphed life lessons. The studio audience does its part, too, with recurring cheers, applause, awwwww’s and oooooh’s. Original Full House creator Jeff Franklin doesn’t tamper with any of this. There’s nary an ironic or cynical moment to be had in the first six episodes made available for review. The closest approximation to snark comes when Episode 1 notes the absence of Mary Kate and Ashley Olsen, the only original cast members who have taken a pass. Stamos, Saget, David Coulier as Joey Gladstone and Lori Loughlin as Jesse’s wife, Rebecca, will appear only intermittently. All are on hand for the extended opening episode before Stamos makes a return solo appearance in Episode 2 and Coulier is on his own in Episode 3 (which turns out to be the best of the opening bunch). None of them are in Episodes 4-6, which actually serves Fuller House well in its efforts to survive on its own with Danny’s young adult daughters, Donna Jo and Stephanie (Candace Cameron Bure, Jodie Sweetin), plus their dorky, intrusive childhood friend, Kimmy Gibbler (Andrea Barber). Bure, Sweetin and Barber are all reprising these roles with an enthusiasm that befits three actresses whose careers otherwise had been largely dormant since Full House left ABC in 1995 after an eight-season run. Donna Jo, now a veterinarian, has turned out to be as unlucky in love as her widowed dad. She’s likewise been left to raise three young children on her own after her firefighter husband died on the job. Sister Stephanie, single and spilling out of party dresses, has become a successful club deejay who mostly works abroad. Kimmy, separated from her philandering husband, Fernando, is trying to keep her teenage daughter happy. But everyone’s home for Danny’s going-away party. He’s relocating from San Francisco to Los Angeles after being hired as co-host of a morning talk show with his new wife. This has prompted him to sell the family homestead, where Donna Jo lately has been living. Awwwww. But of course that’s not going to happen after everyone overhears Donna Jo lamenting her fate. How can she possibly go it alone and care for oldest son Jackson (Michael Campion), pint-sized Max (Elias Harger) and drooling little baby Tommy (Dashielle and Fox Messitt)? Harger as Max seems to improve his delivery episode by episode. He’s genuinely amusing on a fairly consistent basis, particularly when trying to pick out a puppy in Episode 4. Kimmy’s daughter, Ramona, of course is prototypically miserable at first. Aghast at moving in with a big passel of white people, she equates Donna Jo, Stephanie and the kids to “albino polar bears drinking milk in a snowstorm watching Frozen.” The episode was filmed well before the oft ham-handed writers could work in a reference to the Oscars. Fuller House isn’t going to win any awards for being exactly what its predecessor was -- an utterly formulaic sitcom that ranked among prime-time’s 20 most popular series in four of its eight seasons. But seriously, it’s a surprise to see how well the grown-up Bure, Sweetin and Barber work together in the service of a show that employed them as kids, cast them off and now is welcoming them back instead of recasting. Netflix has several “smarter” original comedies in its growing stable, including newcomers Master of None and Love. But young kids can’t watch those thoroughly adult shows -- unless they have ridiculously permissive or absentee parents. 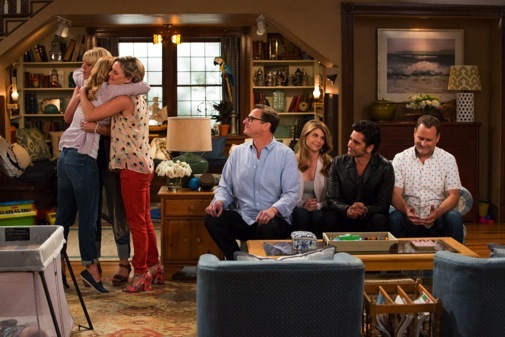 Pretty much anyone can watch Fuller House -- and there should still be a place for that. The first six episodes have a handful of double entendre jokes. And little Billy’s puberty might be accelerated in Episode 1 by the sight of Sweetin in a less than chaste party dress. But this is still a show where “Bring it in” signals a trademark group hug. So maybe we can all just get along with that and let Fuller House serve the audience that’s happy to see it back. Believe it or not, that audience still exists -- maybe more so than many of us TV critic types would like to think.